Those of us who watched Farscape when it was on (1999-2003) know that it was a beautifully shot science fiction show with a staggeringly hot cast of complex female characters spanning many alien species. The hottest was Chiana, a gray alien exiled from her native culture for her rebellious ways and added to the crew in the middle of the first season, becoming one of the main characters and staying on through the final episode and miniseries. Spazzy fangirl that I am, when I met the actress who played Chiana, Gigi Edgley, at a wedding/ unicycle competition in Minnesota yesterday, I gawked and grinned, texted Susie, and basked in her stardom. The rest of the crowd got word that she was a famous actress, but no one else seemed to have a clue about the specifics. BLUE SHIFT is a brand new Science Fiction Adventure comic series by Gigi Edgley, an Australian actress best known for her role as “Chiana” on the hit TV series FARSCAPE, and Brian Meredith, a comic book writer of such titles as Sprecken and Lucifer Fawkes and Co-Founder of the Emerald City ComiCon. The artwork for this series is by Sidney Lima, the artist for Zorro by Papercutz. BLUE SHIFT is the tale of a young woman named Pepper Jones [pictured above], who is abducted and experimented upon by an alien race that capture and sell humans (and other less advanced races) as slave labor for other aliens. However, before these malevolent aliens can finish modifying her for hard labor and blind obedience, the unthinkable happens: Pepper fights back! With the help of another captive, she manages to escape their vile clutches, something that has never happened before. Now, with her new companion at her side, Pepper finds herself traveling among the stars as she makes a new life for herself. 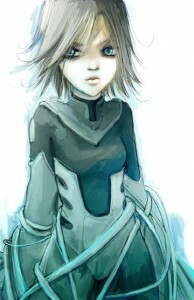 BLUE SHIFT is scheduled to be released as a 3-issue miniseries in the summer of 2008. It is currently being produced by Rorschach Entertainment, which has put together a Blue Shift Preview Ashcan that contains the original 10-page story that started it all. This book is available for purchase online. More info can be found at the Blue Shift website. This entry was posted by florence	on Sunday, September 7th, 2008 at 8:11 pm and is filed under issues. You can follow any responses to this entry through the RSS 2.0 feed. You can leave a response, or trackback from your own site. I am still blown away that you met her! And at a wedding in Minnesota of all places! The comic looks very cool. I will pick it up. Has it been released yet? There are going to be new Farscape comics soon, but I do not know when they will be released. I know!!! Very unexpected and exciting. It doesn’t look like these are for sale yet, but we will keep an eye out. That does it. I have to move to Minnesota.